This is quite an exciting time for us at the TOS. 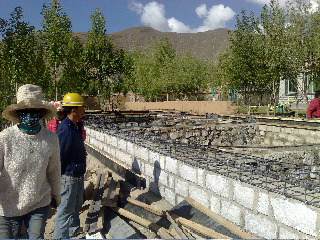 The construction on the building additions to the Chushul Orphanage have begun! It has been 2 years since we began planning the improvements at the orphanage, and since we first asked you to contribute. Your response has been more than gratifying. At every stage TOS members and non members alike have been most generous and supportive of the effort. A month ago I announced that we had received a $5000 matching grant offer that would extend until July 26th. If we could succeed in raising that amount, we would have enough to complete our expanded construction plan. I am happy to tell you that at this point we are only $300 from the goal! Actually, a couple of hours ago we were $400 away, but Carl, a TOS member from Atlanta, happened to ask about it, and when he heard how close we were he reached into his wallet and pulled out a hundred dollars for the project. That's the way this fundraising has gone. 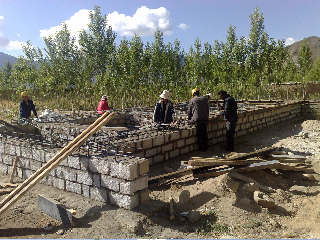 After the disastrous earthquake in the Chendu province 1 ½ years ago, when so many schools and public buildings were destroyed and so many lives were lost, the Chinese government required higher standards for all new construction. The changes in building codes caused us some delay with our architect plans. In the photos you will notice that the masonry work involves substantial steel reinforcement. I look forward to sharing more photos with you as the construction proceeds. If you would like to contribute, you can either send a check to Theosophical Order of Service PO Box 660 Warrrenville, IL 60555, or go to the “Donate” page on the website and choose “Tibetan Orphanages – best use”.